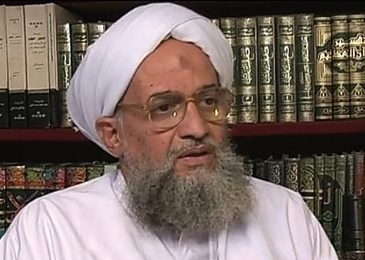 l Qaeda al Hind (AQAH), the Indian arm of Osama bin Laden's terrorist organisation, has achieved viability, more than a decade after Laden included India in the list of priority targets for Al Qaeda, and after his successor Ayman al Zawahiri called for the setting up of a base in this country. Linked to the global organisation via couriers and sympathisers, AQAH has, in the estimate of intelligence professionals, more than 300 members scattered across the country, including in Chennai, Hyderabad, Kozhikode, Jaipur, Patna and Delhi. These are usually professionals below 40, some educated abroad. The number excludes AQAH volunteers presently working in other countries. "AQAH members are dispersed across a range of organisations, some illegal such as the Indian Mujahideen but many operate legally in the guise of NGOs and businesses such as recruitment agencies and travel bureaus." AQAH members function as the backbone of a cluster of extremist organisations, forming a network at the top that ensures the coordination necessary for operations and surveillance to get carried out. "Pakistan's Inter Services Intelligence (ISI), out of deference to the need to keep fooling the United States, provides assistance in the form of sophisticated communications equipment, training and the funnelling of money from private sources in Qatar, Saudi Arabia and Kuwait to groups infiltrated by AQAH, rather than to the organisation directly," a senior police officer revealed. A high-level source, now retired, warned that "the Intelligence Bureau has not been able to pay the establishment of Al Qaeda in India the attention it deserves", because "Home Minister Sushilkumar Shinde has ordered the IB to focus primarily on uncovering what he calls Hindu terror networks". A considerable degree of IB attention and resources have since 2007 gone into "seeking to locate 'Hindu terror' cells, and to monitoring the activities of Hindu organisations across the country, to the neglect of focus on international terror organisations, including those spawned by the ISI", according to a senior intelligence analyst. However, a colleague disagreed, saying that "IB director Asif Ibrahim has been paying increasing attention to Al Qaeda and ISI, and this is why there has been so much success in rolling up several Indian Mujahideen networks". The IM was given strong covert backing by the ISI after the 2008 terror attack in Mumbai, so as to ensure deniability between future attacks and itself. The "reluctance of the authorities to pry into local support networks of the ISI in Mumbai after 26/11, including sympathisers within the state police at different levels, encouraged such groups to intensify their recruitment and to expand their safe houses", a senior intelligence professional claimed. "While Pakistan is the epicentre of Al Qaeda, the organisation has by now got secure bases in India, Sri Lanka, Bangladesh, Nepal and Afghanistan," he added. "Eliminating Narendra Modi is the key aim of AQAH," the source said, the calculation being that "taking out Modi would unleash a violent reaction across the country similar to that which took place in Gujarat after the 2002 Godhra train firebombing by a mob assembled close to the station." Such a calamity would poison communal relations in India for decades to come, and make it easier for Al Qaeda to fulfil the objective of their Pakistan Army allies, "which is to reverse India's economic gains and bring India to zero growth," an individual tracking the ISI pointed out. Apart from Modi, another focus of AQAH is Syria. "The war in that country between Wahhabis and the Assad administration requires tens of thousands of volunteers, and India has been targeted as a source for hundreds and eventually thousands of recruits for Al Qaeda operations in Syria," a country where the ongoing conflict has resulted in the creation of multiple safe zones for terror operatives to train and recuperate in. According to a senior intelligence operative, a section of Syrian and Yemeni students in universities in India are trying to recruit Indians to go to Qatar, Saudi Arabia and Turkey to join the brigades being formed there. "While most Syrian students are apolitical, there are a few in Delhi and in Hyderabad who have been recruited by Qatari and Saudi sympathisers of the Syrian armed opposition to try and persuade other Arab students and also Indians to join in the fighting," a technical analyst claimed. He added that in his estimate, "more than 200 Indian citizens are already active in the Syrian conflict". These function from Qatar, Turkey, Saudi Arabia "and an estimated 40 in Syria". He was worried about the fact that "these recruits will have the capability to take on armed military formations after their training and experience, and these skills may get used on the side of insurgent groups" in India. According to a Syrian expert, there are more than 130,000 foreign fighters in various Qaeda-linked formations in Syria, including more than 6,000 from European Union states and about 400 from the US. The largest Arab contingent is from Libya (22,000), followed by Saudi Arabia (16,000) and Tunisia (13,000). There are also about 2,000 fighters from Chechnya in the Russian Federation. According to an official, "Thus far, Indian intelligence agencies have not paid much attention to the ongoing recruitment of their nationals for operations in Syria." This is unlike Germany, which has sent intelligence professionals several times to Damascus to get details of EU nationals killed or captured by the Syrian army and air force. He warned that "there is recruitment for operations in Syria in the guise of mobilising financial support for the groups fighting there". This, according to him, "is even taking place at centres in Delhi", including in a prominent university, besides Pune, Hyderabad, Kozhikode and Chennai. "The new government will have a major problem on its hands, as there will be a determined effort by AQAH to create chaos in India after the polls," adding that "tracking and neutralising this network has to become the priority for the IB."